This series of workshops is designed for the absolute beginner to learn some fundamental art making skills. Focusing on building basic, practical skills, you will learn techniques specific to a medium, while also studying how other artists have used the medium in the past. You take home a finished artwork at the end of the class. Highly recommended for anyone interested in learning and reinforcing basic art-making skills, this series will offer glimpses into artists’ ways of seeing and provide you with the practical knowledge to make new discoveries. A friendly and supportive environment for beginners and those who would like to refresh the basics. 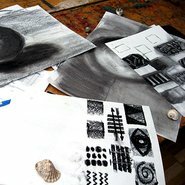 In this workshop you will be introduced to mark making and basic drawing techniques. Experiment with the versatile qualities of pencils and graphite, and experiment with tone, texture and composition. Learn to see and interpret simple objects to create a still life. This class is for beginners and those who would like to refresh the basics. Continuing with the still life theme, enjoy the challenge of adding colour to your composition. With the same versatile qualities of lead pencil drawing, coloured pencils will add an extra challenge. You will be guided through simple techniques to help you explore the range and versatility of colour pencils. Charcoal is a popular medium for many artists. Artists enjoy it’s versatile qualities and are able to create rich depths of tone and contrasts. Charcoal has the range to help you create sensitive and detailed drawings as well as daring and dramatic marks for more expressive gestural drawings. Experiment with charcoal’s many creative possibilities. This workshop introduces you to basic colour theory by isolating colour from the creative experience into a practical exercise. By painting your own complex colour wheel, you will learn how to mix colour, adjust colour values, see colour relationships and control colour. You will experience the subtleties of seeing colour in all its complexity, and begin to understand how it operates, so that you can use it in any medium with confidence. In this class you will learn simple colour mixing and some different painting techniques. Starting with thumb nail sketches to work out a variety of composition ideas you will learn how to see tonal relationships which will be applied to a small still life composition. This month we will learn some basic watercolour techniques, brush control and mark making. You will complete a colour chart before starting your own work. Brenda will assist by demonstrating various techniques. Building up confidence with a series of exercises, a playful fun approach is encouraged. Watercolour is a popular medium used extensively by artists for its fluid transparency and free flowing nature. Following on from last month we continue our exploration of watercolour. Enjoy experimenting with simple exercises to build your confidence. Looking at examples of different artists approaches to the medium, Brenda will demonstrate glazing and layering techniques. You will complete an experimental composition inspired by both, new techniques and artists you have studied today. While this class is a follow on from the July workshop, it is not a pre-requisite. Working in chalk pastel is the closest thing to painting with drawing. Pastel is a versatile medium with which you can draw, smudge, blend, rub back. The perfect medium for exploring colour and tonal qualities. Looking at how artists have used pastels, particularly the work of Degas, famous for his pastel drawings, we make studies of his technique and apply this technique to simple objects. Working from photos and images of landscape paintings in the collection, we will discuss strategies to understand and construct a traditional landscape. We learn how to see and simplify the landscape, by using viewing frames to make quick thumb nail sketches which will then be built up with ink and watercolour to create quick loose impressions.